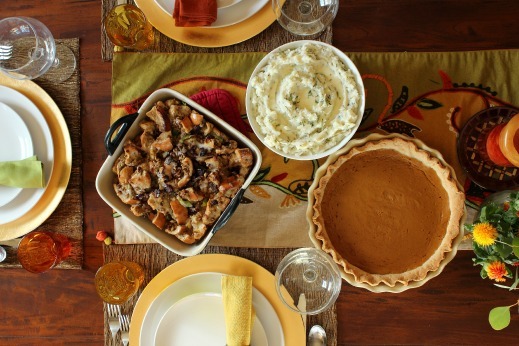 Are you ready to free up your oven during the holiday season? 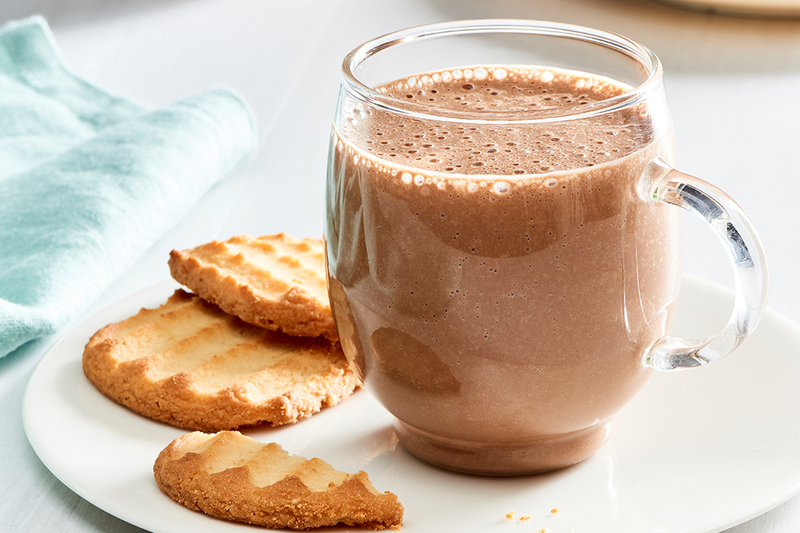 Then it’s time to turn over dessert duty to your KitchenAid® Slow Cooker! Now you can take the stress out of serving up a sweet finale by slow cooking your way to the easiest-ever Cinnamon Apple Crisp topped off with your choice of ice cream or whipped cream. When it comes to apple crisps, my go-to combination of apples is Fuji and Gala, as you get the best overall flavor and texture since the apples really hold their shape even after hours in the slow cooker. Once you’ve sliced the apples into large wedges, add them to the slow cooker along with a mixture of fresh lemon juice, cornstarch, brown sugar, cinnamon and nutmeg. 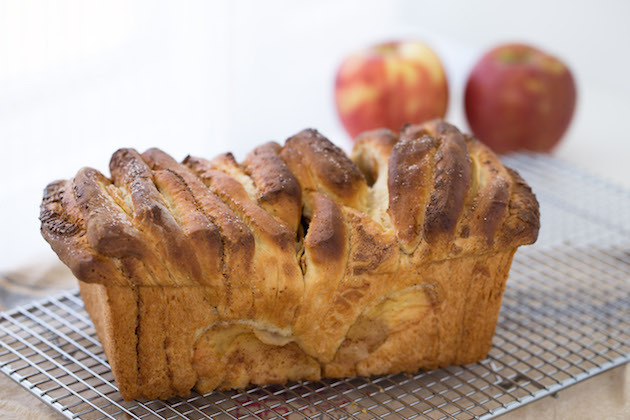 The lemon juice prevents the apples from browning while the cornstarch thickens the liquid released from the fruit. And then it’s time to prepare the crisp topping. In a small bowl, combine the flour, oats, cinnamon, brown sugar and cubed cold butter. Using your fingers, work the butter into the flour mixture until it is the texture of wet sand and clumps together easily. Next, sprinkle the oat mixture evenly on top of the apples and cover the slow cooker. 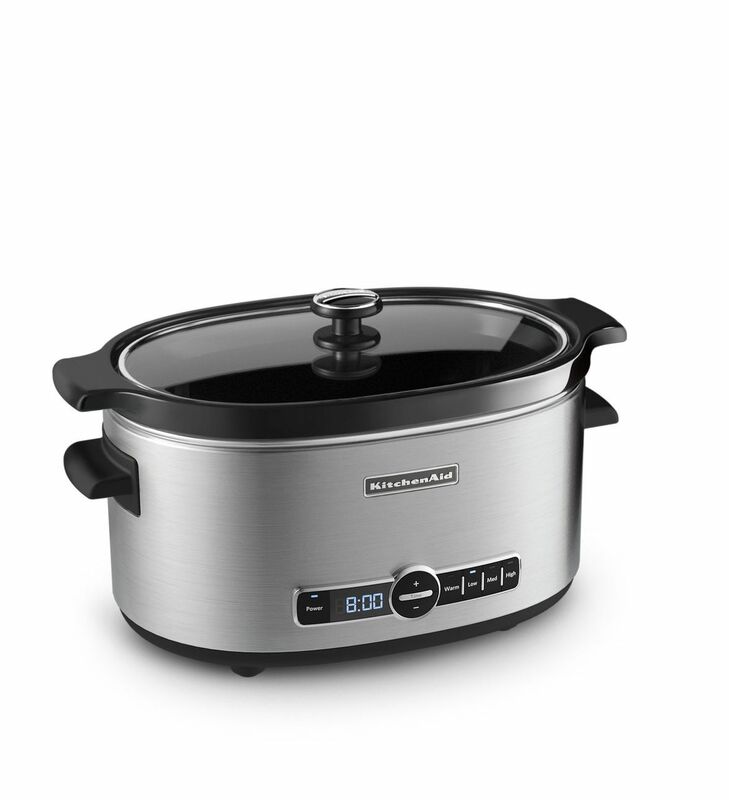 The large size and multi-functional settings of the slow cooker provide several options for the temperature and time settings. For the crisp, set the slow cooker to HIGH for 4 hours. Unlike traditional apple crisps, the oat topping will be doughier in texture. And have no fear if excess liquids are at the bottom of the slow cooker. They guarantee the apples remain moist while cooking in their own sweet juices. Once the crisp is finished cooking, you can serve it immediately, or set the slow cooker to the KEEP WARM mode to allow guests to serve themselves a hot scoop of the fruity dessert straight from the source. Then all that’s left to do is top off your warm bowl of stewed apples and oat topping with a scoop of ice cream or a dollop of whipped cream and your set-it-and-forget-it dessert is served! 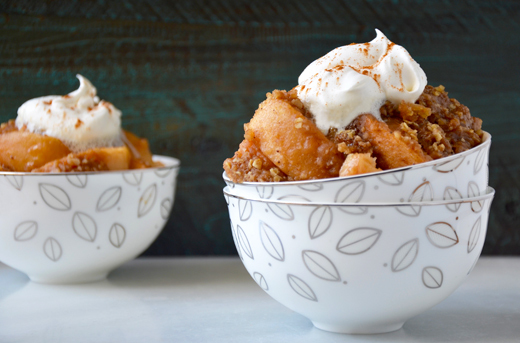 Be sure to share your take on this slow cooker cinnamon apple crisp recipe with us on Instagram using #MadeWithKitchenAid for a chance to be featured. Peel, core and cut the apples into large wedges. Add the apples to the KitchenAid® Slow Cooker. In a small bowl, whisk together the lemon juice, cornstarch, brown sugar, cinnamon and nutmeg. Pour the mixture into the slow cooker and stir until the apples are well coated. In a medium bowl, combine flour, oats, cinnamon, brown sugar and butter. Using your fingers, work the butter into the flour mixture until moist clumps form. Sprinkle the mixture on top of the apples, then cover and set the slow cooker to HIGH for 4 hours. If not serving immediately, set the slow cooker to KEEP WARM mode. When ready to serve, scoop out the crisp into serving bowls and top it with whipped cream or ice cream.